The M1 is one of the few tanks in the world equipped with a ceramic composite armor known as Chobham. This is a British invention, used on the UK’s Challenger tanks, but it was actually the Abrams that first used it. The ceramic is extremely hard, but shatters when hit by a shaped charge. Modern shaped anti-tank munitions aren’t made so much to destroy tanks they’re made to penetrate the armor and blow up from the inside, killing the crew. Because ceramic armor shatters when hit, the cracks break apart the jet of the shaped charge in a way that older steel armor doesn’t. Several layers of ceramic are sandwiched together, along with depleted uranium for added strength, and this is used to dissipate the kinetic energy of incoming anti-tank rounds. 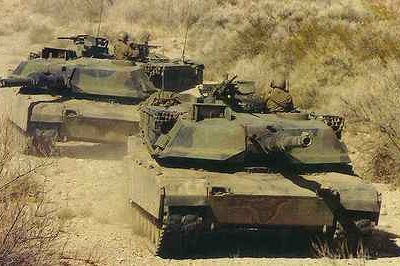 In addition to the Chobham armor, the M1 has reactive armor for additional protection from shaped charges as well as less sophisticated weapons like RPGs (rocket-propelled grenades). Simply put, this is armor is packed with explosives that explodes outward when hit, destroying the projectile before it can damage the tank. The theoretical work on this was done in the Soviet Union in the late ’40s, but a German-Israeli collaboration in the late ’60s produced the first meaningful results in the field. It was finally ready for use not too long after the introduction of the M1. The M1 has a crew of four, a commander, a driver, a gunner and a loader. Tank interiors have come a long way in the roughly 100 years they have existed, but it is still no place for the claustrophobic. The main gun dominates the layout of the interior, with two of the four crew members being concerned only with its operation. The safety of the crew is of primary concern, and the whole interior is designed around this objective. The damage control systems are extensive, and mostly rely on directing fire and explosions away from the interior. Ammunition and fuel are kept in special compartments designed to explode outward if they are hit or catch fire. Access to the ammunition is also controlled by a special door that opens to allow the loader to pick up one round and then close again. There is a fire suppression system as well, activated by a T-handle and the each have a hand-held fire extinguisher. The commander has a sophisticated Position/Navigation (POSNAV) system that not only allows for easy navigation, but also supplies unit commanders with information on the locations of the M1s under his or her command. The drivetrain of the M1 is one of the more unusual features found on the tank. The M1 uses a Honeywell AGT1500 multi-fuel turbine engine that produces 1,500 horsepower. Turbine engines in tanks aren’t entirely unique to the M1, but poor fuel economy compared to piston engines has kept many manufacturers from adopting them. Balancing out this disadvantage is the fact that the turbine engine is smaller, lighter, more reliable, requires far less maintenance and can run on basically anything that will burn. It’s still an unusual choice, but to understand it, we have to look all the way back to the ’60s. Back in 1963, Chrysler had built 55 production prototypes of a turbine-powered car to explore the possible automotive applications of this relatively new technology. The car was supremely good in many different ways, but proved not quite right for the automotive market. 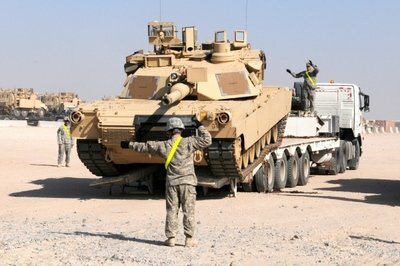 So when Chrysler got the contract to built a new main battle tank, it finally found a use for the technology. So Chrysler worked with Lycoming initially to develop the engine, before production was eventually taken over by Honeywell. A version of the engine was adapted for helicopter use, but was never actually put into any vehicles, meaning that the M1 is the only vehicle that uses this engine. The engine does sound very different from the usual diesel powered tanks, and is much quieter as well. The engine does sound very different from the usual diesel powered tanks, and is much quieter as well. This works to the M1’s advantage, as the enemy doesn’t always know that the tank is approaching until it’s too late. It has earned the M1 the nickname “whispering death”, although it’s still a tank and not as loud, is still pretty loud. Speed is another factor that works to the tank’s advantage, being capable of up to 30 mph cross-country and 45 mph on roads. It is theoretically capable of hitting 60 mph, but this puts inordinate stress on the treads, so the top speed is governed. Troops can ride on top of the tank as transportation when not in combat, but the high temperature of the exhaust means that they cant stand behind it for cover. 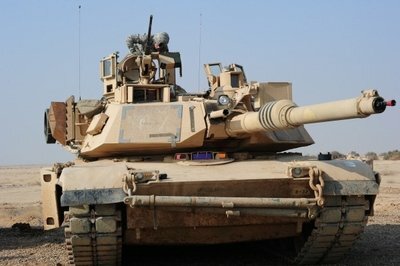 General Dynamics has been working on a diesel replacement for the turbine engine, but there are no immediate plans to put it into any tanks. Now we get into the main reason for the M1’s existence. The M1 has had two different main guns, but neither of them are unique to the M1. The first was a British system, a 105mm rifled gun that was in use on the British Centurion tank. 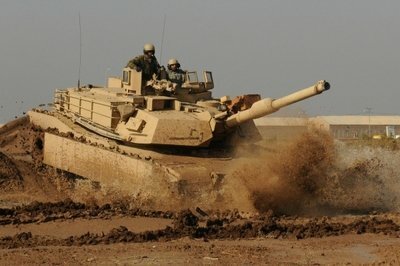 This proved to have an inadequate range and lethality for newer (at the time) tanks like the T-72. So the main gun was replaced with the 120mm smoothbore from the German Leopard 2 tank. This not only has a better range, but is also able to use a wider variety of ammunition. There are armor piercing and high explosive rounds used with it, and a newer addition is a canister shot — essentially a giant shotgun shell full of 9.5mm tungsten balls. The main gun is controlled by a targeting computer that works incredibly fast. This is theoretically useful against infantry attack, but it tends to be used more for breaching concrete barriers and destroying ambush positions. The main gun is controlled by a targeting computer that works incredibly fast. Evidence of this comes from the only time that M1s have really been engaged in large-scale tank-on-tank combat, during the 1991 Persian Gulf War. Not a single M1 was destroyed by enemy fire, and while this is partly a testament to the effectiveness of the tank’s armor, the main reason was that almost none of them were ever hit by enemy fire. Thanks to the M1’s superior range and targeting capability, not to mention night vision equipment, enemy tanks were destroyed before they had a chance to fire a single shot. For dealing with infantry, the M1 has a variety of secondary weapons. The most powerful of these is the commander’s M2 .50 cal. machine gun. This is located in front of the commander’s hatch and can be fired manually or remotely in areas where opening the hatch would be too dangerous. There are usually two 7.62mm M240 machine guns as well, one for the loader and one coaxial gun operated by the gunner. There is an option of a second M2, also coaxial and remotely operated for M1’s that have been outfitted for urban warfare. The M2 packs a serious punch, and it adds much more serious close-range firepower than the M240. The Army is currently working on a new kind of ammunition for the M1, called an AMP (Advanced Multi-Purpose) round. Essentially, this would be one kind of ammunition that could do everything via a selectable fuse controlled by the targeting computer. This sounds pretty advanced, but then the military plans on using the M1 through at least 2050. Just think about that for a second, one model of tank in service for a minimum of 70 years. This is partly because the M1 is so well made, but a hugely important factor is that it was designed to be adaptable, with upgrades to weapons, armor and other systems being easier than ever before. It’s a supremely good machine, and it’s a good thing too, since we’ll have them for a while.